“A Gap in Generations” is a great success! 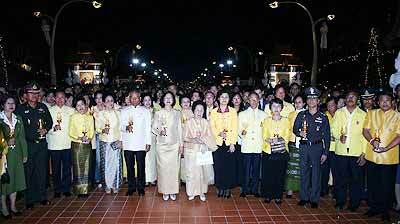 The whole country celebrated HM King Bhumibol Adulyadej’s 80th birthday on December 5 with festivities, prayers and a nationwide effort to wear yellow _ the color that symbolizes devotion to the world’s longest reigning monarch. Tens of thousands of people in yellow shirts, waving yellow flags packed the streets around the Grand Palace in Bangkok where His Majesty made a rare public appearance from the balcony of his ceremonial Throne Hall _ only the sixth such appearance in his 61-year reign. People traveled from cities around Thailand, hoping to catch a glimpse of the beloved monarch. Some camped out the night before along the path of his motorcade. A woman in the crowd was ecstatic after seeing His Majesty’s cream-colored Rolls Royce drive past. Far from the center of celebrations, people everywhere donned yellow _ from supermarket cashiers and morning joggers to business people. HM King Bhumibol’s birthday is a national holiday in Thailand and has increasingly become a day of nationwide tribute to the man who is the most influential figure in modern Thai history. 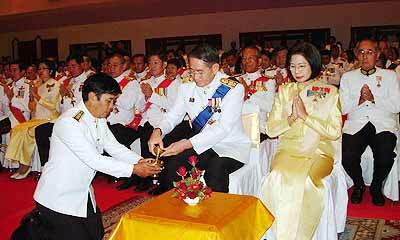 Many Thais have never known another other sovereign. Throughout his 61-year reign, the King is widely recognised as the heart and soul of the nation. He has devoted his efforts tirelessly for the well-being of his subjects. The King has continued to demonstrate his deep concern for his kingdom and brought great improvement to the quality of life of the people through his various royal projects. Everywhere around the nation, people showed respect for the monarch by saying prayers and performing merit-making ceremonies that typically involve freeing captive animals, including birds, turtles and fish. Fireworks lit the skies on Wednesday night in every city in Thailand as part of weeklong celebrations. to pay homage to HM the King. People of many nationalities performed cultural shows on stage. 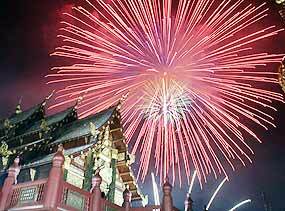 of praise to HM the King and marveled at the brilliant fireworks. In Chiang Mai, festivities were also held all over the city. Early in the day at the Chiang Mai University Conference Hall on Ninmanhaemin Road, Wiboon Sa-nguanphong governor of Chiang Mai province led more than 5000 people from both the public and private sector in a ceremony to pay homage to HM the King. Julie Annellie Manus and Louis enjoying the delightful music. John, Lois, Peter and Judy enjoying their just deserts. and helpers for the evening. Tangerine Blue performing with Aard and Mark singing. The FERC Board. (Back row l-r) Frank, Mar, Scott Luxami, Mike. which was auctioned at the end of the evening. 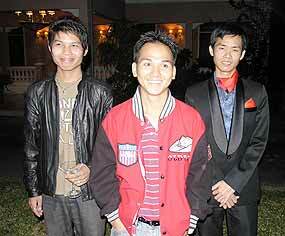 Aim with artist Lek and singer Aard. 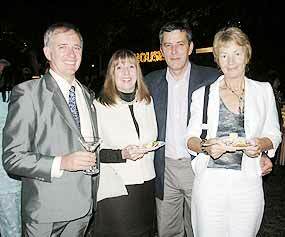 Terry, Donna, Debbie, Sasitorn, Tom and Mark seem quite content having sampled the pastry chef’s desert creations. 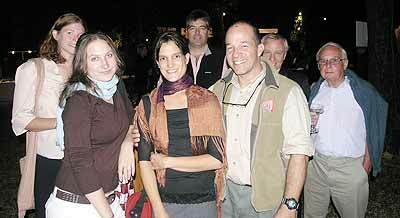 Amy, Annie Oakley, Graziele, John, Jon, Philip and Martin party for a good cause. Ah, Sweet Charities! 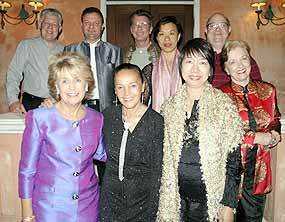 The Foundation for the Education of Rural Children (FERC) recently hosted an elegant and unusual evening – Sweet Charities - in the garden of the Hinlay Curry Restaurant, known locally as the Old Japanese Consulate. 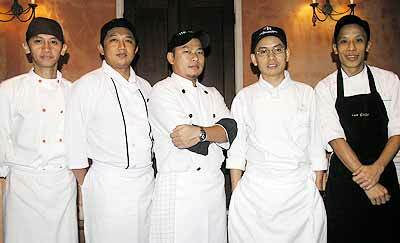 To make the evening especially sweet, chefs from local five star hotels and restaurants manned work stations displaying – and serving - their favorite desserts. Brownies, cheese cake, flourless chocolate cake topped with crème anglaise, rich milk cassoulette with bourbon, and a very special chocolate fudge helped to satisfy the sweetest of sweet teeth. 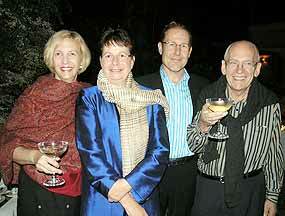 Guests were greeted by board members as they entered the gates and were served a glass of sparkling wine after being shown into the beautifully lit garden. Music by Tangerine Blue set the stage for a lovely evening under the palm trees and featured a variety of favorite show tunes. Mild winter breezes kept everything cool, including the inviting desserts. Abstract artist Chang Lek displayed and sold small landscape abstracts, described by artist Galen Garwood as “little visual desserts”. A portion from the sale of each painting was donated to FERC. Rebecca Lomax, FERC board member, welcomed the guests and described the FERC scholarship programs and the children who have received assistance through the years. She stated that FERC scholarships had been awarded to children in the mountains as well as to rural children attending school in Chiang Mai, to students who were at all levels of their educations from pre-school to college, and to disabled students as well as those without disabilities. She described some of the reasons that students needed scholarships, and the risks posed to children by not having an education. She then recognized the guest chefs and their sponsoring hotels and restaurants, The Chedi, D2, Four Seasons, Sofitel Chiang Mai and The House, as well as Siamese Traders and Nacha Coffee for their donations of teas and coffee, and the Hinlay Curry Restaurant. Then she introduced Chang Lek and Galen Garwood, guest artists, and directed guests to the table displaying Chang Lek’s art work. The performing musical group Tangerine Blue and its members, John Smith, Mark Gerard, Ong-Ard Kanchaisak and Jaruwat Kitisith were introduced. Each group was thanked for its charitable contributions to the welfare of children in Thailand, and for their work in making Sweet Charities a success. 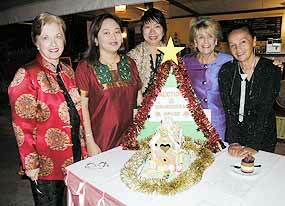 June Unland donated a gingerbread house for the event, which was assembled by Chef Wanlop of the Four Seasons Resort and auctioned to the highest bidder later in the evening. John Richard, the winning bidder, generously donated this charming bit of edible art to the children of the Viengping Children’s Home. The door prize was drawn by FERC volunteer and webmaster Mike McCune from business cards deposited in a beautiful large bowl on entering the venue. A voucher for an overnight stay at the Shangri La Bangkok was awarded to the lucky winner, Saisitorn Thamthai. Tangerine Blue provided music for the entire event. Guests enjoyed the romantic “Misty” and “Love Me or Leave Me” along with the provocative and humorous “Have You Met Miss Jones?” and melancholic “Autumn Leaves”. The group then turned up the volume a bit for a lively banjo set that had the guests tapping their feet and applauding loudly. “Thoroughly Modern Millie” and “Wilkommen” were favorites, but “Lambeth Walk” stopped the show. The group ended with Louis Armstrong’s famous hit, “What a Wonderful World”, perhaps a fitting description of the lovely evening. 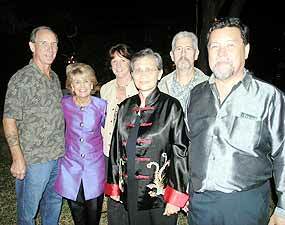 Proceeds from the event benefited the organization’s scholarship fund. It was cold – probably the coldest week Chiang Mai has known for a long while, and this was an outdoor performance , as is traditional with Italian Commedia dell’ Arte plays. However, those many who braved the weather were in for a treat. 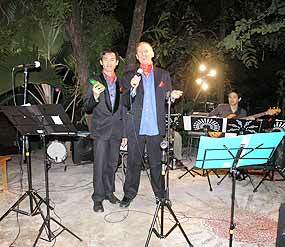 The audience, old and young, both Thai and foreigners, found themselves laughing throughout the entire performance. We knew that some of the cast were expats or local people, and some professionals, but on the night it was very hard to tell the difference between experience and total enthusiasm resulting in excellence. The story, a traditional late 16th century Commedia dell’Arte tale, based on a group of travelling players and an improvisational “play within a play”, featured the classic Commedia repertoire of love, old age, jealousy, etc, with characters identified by their costumes, masks and props. The established characters included the lovers (innamorati), the elders (vecchi), and the Zanni (the eccentric servants) who are persuaded to help the innamorati to obtain their dream of marriage and forgiveness all round! square in old Bologna, peopled by types that could have strayed in from “The Merchant of Venice” or “Romeo and Juliet.” The play is presented in true Commedia dell’Arte style, including the costumes and masks, and is, as the Washington Post critic stated and the Chiang Mai audience soon realised, “packed with belly laughs”!